coininvest.com is pleased to present the 2017 2 oz Queen's Beasts Silver Dragon. Eagerly anticipated by the world's collectors and investors, this is the third release in the prestigious Queen's Beasts Series from the UK Royal Mint. The 2 oz Silver Dragon is a striking addition to any collection and its larger size enables you to fully appreciate the intricate design details. Since each coin contains two Troy ounces of fine .9999 Silver, the Queen's Beasts Dragon is of equal interest to investors. The 2 oz Silver Dragon is part of the Queen's Beasts Series of BU coins. The series was launched by the Royal Mint in 2016 with the Lion of England coin and is based on the mythic heraldic beasts of the British monarchy. Only one coin was issued in 2016 and the series of 10 coins will end in 2021 with another single issue. From 2017 to 2020, two coins per year will be struck. The Queen's Beasts Dragon is the second issue for 2017 after the Griffin of Edward III. The 2 oz Queen's Beasts Dragon Silver bullion coin was designed by artist Jody Clark. The reverse shows the Red Dragon of Wales or, as it is often called, the Red Dragon of Cadwaladr in reference to Cadwaladr ap Cadwallon, King of Gwynedd from 664 to 682. The Red Dragon was the badge of Owen Tudor and was chosen by Henry VII to signify his ascent from Cadwaladr - although there is no historic evidence to back this claim. The obverse features the famous 'fifth portrait' of HM Queen Elizabeth II, making the 2 oz Silver Queen's Beasts Dragon one just a few BU coins to have both the reverse and obverse designed by the same artist. 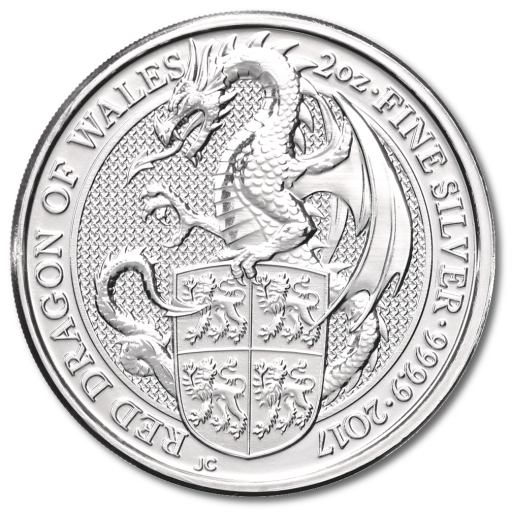 Silver is considered one of the safest investment options and it's also the ideal precious metal to show off the superb details of the Queen's Beasts Dragon. The Red Dragon of Wales is shown with forked tongue and wings fully extended and bearing the lion shield that was the coat of arms of Llewellyn ap Gruffudd, last native-born Prince of Wales. Based on the popularity of previous issues, the 2 oz Queen's Beasts Silver Dragon is likely to sell out quickly. Order now from coininvest.com to ensure that the 2 oz Silver Dragon becomes part of your collection or portfolio. Very fast delivery. Exellent coin.